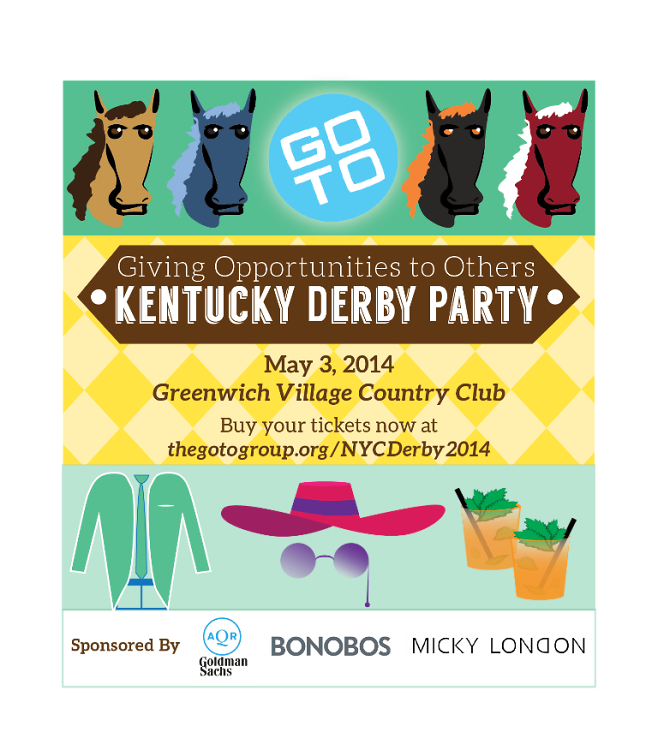 GOTO will host its second annual Kentucky Derby Party at the Greenwich Village Country Club on Saturday, May 3rd, from 4:30pm to 7:30pm. Your ticket buys a front row seat to a big screen broadcast of the races while imbibing endless mint juleps and bourbon cocktails at a 3-hour open bar. You can even PLACE YOUR BETS! That's right. New York's Off Track Betting may be a mere memory, but you'll be able to put money on your favorite horses all day long via DerbyJackpot, the 100% legal online race betting company. Not a fan of equestrian pursuits? Play bocce, mini golf, or table tennis with your friends while snacking on delicious appetizers. DJ Tim Martell will also be on hand to spin tunes and keep the party going all day long. GO HERE to purchase a ticket. Make a $25 donation to GOTO's scholarship fund by upgrading to a VIP ticket! All VIP tickets come with a commemorative GOTO rocks glass and a ticket to enter one of our amazing raffleswith prizes from Bonobos, Micky London and more. So say giddyup for a good cause! As always, all proceeds provide arts scholarships for deserving middle school students.